It is my Mom's birthday today, Jan 29th. I won't get into any age details just to be safe. I decided that this year I would make her a hot pink birthday cake from scratch. I had never tried a cake from scratch before. It turned out to be pretty much as easy as boxed cake mixes and it tasted much better. Two drawbacks of surprising someone with a birthday cake, one you can not leave them the mess to clean up and two you have to bake something else to explain the baking aromas in the house. Here is the link to the recipe if anyone wants to give it a try someday. The recipe is from Ina Garten's show, Barefoot Contessa. Two posts in a row, must be a new record for my blog. I am posting again so soon because I have some exciting news. Last night, Jan 26th at about 11pm I noticed my first two onion sprouts. This is very exciting and extremely fast, it only took 5 days for them to start sprouting. I have started plants from seed since I was about 7 or 8 years old and it is still exciting to observe. Today there is all kinds of onions popping up in the 'Prince' storage onion pot but no sign of any 'Armador' shallots yet. I have also done a bit of work in the veggie patch over the weekend. Those huge icicles overhanging my coldframe really started to freak me out so I had to do something about it. I got all bundled up, grabbed my shovel and ice scraper and proceeded to un-capsulate the coldframe. After I had all the snow and ice off, I then ripped down some plywood and covered up the glass. Now I can relax that my coldframe will make it through the winter without shattering. Next year I will definitely be relocating it. eating some spring brussels sprouts. of the snow. It sure is one tough plant. First I have a correction to make. Well cleaning the basement over the weekend I found a fluorescent light package. It stated a 48", 40 watt, cool white fluorescent bulb is 3200 lumens. The information that I found previously said they are 500 lumens, big difference. So the correct amount of bulbs to replace the one 400 watt metal halide is 11.25 bulbs. Just thought I would clarify and I will edit my previous post. Now that the exciting part is done.... I have hauled all the plants out of the spare room upstairs and they are now soaking up the artificial sun in the basement. Everything looks a little stretched at the moment. They should perk up now that they are in the much cooler basement with stronger light. Currently under the light is 2 banana trees, lemon tree, assortment of succulents & agaves, many geranium and other annual cuttings, foxtail fern, orchid cactus, passion fruit vine, bougainvillea and my onion seedlings. I have a lemon growing that is about twice the size of a golf ball. The lemon tree is a variegated pink lemon and this will be the first time it has developed a fruit. Does anyone know how long it takes for a lemon to develop, under less then idea conditions? These geraniums have a bit of a funny story. We had gone waterfalling in Hamilton one evening last summer. We left the waterfall at dusk and headed home. Well at a stop light we looked over and saw a mass planting of these in the center median. We then pulled over and I ran out into the center of a 6 lane road, in the dark and scooped a couple cuttings. Isn't it a cool geranium? I had never seen anything like it before. I still have a few to do's in my grow area. I have to install one more adjustable shelf between the two banana's to get a couple plants off the floor. I have to prune the annual cuttings and spread them out so they are not shading each other. I also have to get a new bulb for my light. I think this will be the fifth season I have ran the light and they need to be change before they burn out. Red Icculus was telling me that they start losing lumens after 6 months so it is about time to re-bulb. After some poor onion results last year I decided to grow my own onions from seed. I started to research how to grow onions and what a mountain of information there was. I found most of my information on Dixondale Farms page, they provide a lot of information on onions as well as grow and ship transplants within the USA. First off onions are day light sensitive and consist of Long Day, Intermediate Day & Short Day varieties. I am in the northern section of North America so I have to grow Long Day varieties which need 14-16 hours of day light to start developing bulbs. With them needing such long daylight hours to start developing bulbs it gives them a longer season to grow leaves and get big. The more leaves and the bigger the plant, the bigger the bulb will be when it starts developing. This year I am growing Prince F1 for a large yellow storage onion and Armador F1 Shallots for a small storage onion. 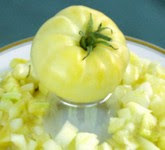 There is a couple ways of growing onions, the first being in a community pot or flat. They don't mind growing close together and a community pot makes them very easy to look after. You can also plant them in cell packs and thin to 3 plants per cell. I choose to use terracotta half pots so I can use them year over year, those cell packs don't seem to hold up well for reuse. Now fill your container of choice with potting soil, pack it down and water until the soil is completely saturated. Potting soil has a tendency to repel water so if it is not saturated to begin with it can be problematic to get wet later. Once the soil is good and wet, let the excess water drain out for about 10 minutes. With the soil wet, start to broadcast your onion seeds over the area. I usually use extra seed and then thin when they germinate. You can use the extra sprouts to transplant into bear spots and eat the left over as onion sprouts. Once your seed is in place top dress your containing with about 1/2" of soil and gently tamp the soil down. From this point no more watering is needed. The top dressing will become saturated from capillary action from the moist soil below. Then label your pots and place them in a seed propagator. Place the propagator under a grow light or on a window sill and make sure that the light is on for less hours then need to produce bulbs. For the Long Day onions I am growing I will leave the light on for 8-10 hours a day. The seeds should germinate within 4-13 days depending on soil temperature and need little care well in the seed propagator. Once most seed has germinated and grown a little bit, remove the pots from the seed propagator to avoid any mold growth. Once the onions start to look crowded thin to approx. one plant every 3/4" and the tops can be trimmed to 4"-5" to bulk the seedlings up as well as control leggy growth. When the weather is better I will move these into my cold frame and then transplant them into the soil once my area is frost free. This is the bulb with some distortion from the flash. shade & hanging chains are all attached to the junction box. This is the remote ballast box. My current bulb produces 36,000 lumens and consumes 400 watts of power. This compared to a typical 48", 40watt fluorescent bulb which produces approx. 3200 lumens well consuming 40 watts. In other words it would take 11.25 four foot, 40watt fluorescent bulbs to replace the one 400 watt metal halide lamp. A metal halide lamp is by far the most efficient light source per watt and this is why they are used in most retail & commercial settings for lighting. The main purpose for this light is to over winter plants that I grow outside. I have so many that if I did not have this light I would have plants in every window of the house. It is also a great source of light for growing seeds so it is a win win situation. If I was just using this grow light to start seedlings I would probably go with a 250watt metal halide which would be more then sufficient to cover a 3 foot by 3 foot area and would cut the power use almost by half. I think the adjustable shelves I added this season will work really well. Previously I was using some rickety wood tables that I threw together and then used an assortment of boxes and crates to position things. I almost knocked by seedlings over a few times so this set up should be much better. All I have to do is get all the plants under the light and get my onion seeds planted. My next two post will be about starting the onion seeds and showing what plants I over winter. Click this link to see what I have overwintering under the light. The seeds I order from johnny's came yesterday, pretty fast for cross border shipping I must say. In fact so fast my growing area is not set up yet. It shouldn't take me much longer though, I have painted the walls and have put the new ceiling tiles in, kind of sprucing up the basement lately. All I have left to do is hang the adjustable shelves, hang the light and I will be ready to go as well as share my grow light setup. I have also started to save the seed from the cherry tomatoes from the grocery store. Being from the grocery store I have no idea if I will end up with what I purchased but it is worth a try. To save the seed I just cut them open, scooped out the seed into a bowl and added a little bit of water. I will then let them mold a little bit to release the seed jell, rinse, drain and dry. I hope they come true as those zebra ones are pretty cool and tasty. I am also going to do a few seed trades with fellow veggie bloggers. In return for some of my varieties I am going to be receiving Variegated Tomato seed from Ottawa Gardener and Pink Berkely Tie Dye seed for Judy. I am also going to share some of my Cherokee Purple seed with Skeeter to go with her purple peppers she grew last year. This tomato seed swap stuff is kind of fun. Lastly I have been watching the icicles grow larger and larger over my veggie trellis and cold frame. I am beginning to think I should have thought of this before I placed my cold frame there. Lets hope they don't let loose all at once or I may not have any glass left. Some Veggies To Blog About! 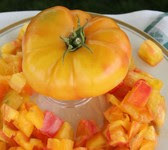 I must admit I was rather veggied out after the summer season and the poor results I had with my fall crops. 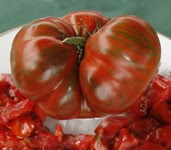 Now things have changed, the garden blogger world is abuzz with talk of tomatoes, new seed varieties and garden plans. This has spark my interest again and I have been rummaging through various seed suppliers looking for what I am going to grow this year. The first seeds I found at the grocery store in a mixed pack of heirloom cherry tomatoes. 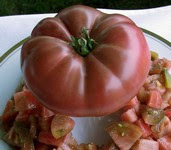 I thought this is great, I can get some seed and have some tomatoes to eat at the same time. The ones I am most interested in are the zebra and mini plum tomatoes. My second seed find was from Johnny's. I mainly placed the ordered because I need some onion seeds to start asap. I chose 'Prince' which is a large, yellow, storage onion. It is an F1 hybrid and is a long day variety which is perfect for my area. After my lack luster onion results last year I am going to start my own transplants and start them early to hopefully end up with some massive onions. Well on their page I also ordered the following: French Chatentais Melon, Baby Bok Choi, Toscano Kale, Armador Shallots, Big Chile II (anaheim) & Tauro Radicchio. Most things were clearance priced which was nice but I was took to the cleaners for the French Charentais Melons. At a whopping $7.75 for 20 seeds, ouch. I just could not resist, they look so nice and I have heard they are one of the best tasting melons around. I have about half of the varieties I am going to grow picked out and I am still working on the rest. I will do a full varieties list when I get them all selected. Until then I will continue to dream of this seasons crops, my building plans and that in 1.5 months I will be growing crops in my cold frame! Posts to come: my light setup, how I set my gate posts(long time coming), planting onion seeds & the second set of photo's from the Bruce Peninsula. 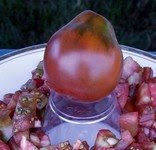 Start by selecting the largest bulb you can find and inspect that it does not have any moldy spots and that it is firm. Now find a pot that will accommodate the bulb leaving 1" between the pot lip and the bulb. Fill the pot about 3/4 full of potting soil and then place the bulb in. Now add soil until the bulb is 2/3 below the soil, leaving 1/3 of the bulb above the soil. Tamp the soil down and give it a good soaking. Then place the potted bulb in the strongest light you can provide and water very sparingly until the blooms starts to develop. This will fend off any rot that can occur well the roots start to develop. This one is already starting to bloom out of the package! After 2-4 weeks you will have a blooming Amaryllis. After the Amaryllis blooms you should cut off the flower stock(s) and keep it in the strongest light you can provide. It will grow strap like leaves that are approximately two feet long over the winter. 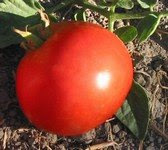 The plant should be watered once a week or after the soil has started to dry out. As soon as there is no risk of frost the plant should be hardened off into full sun outside. This will allow the plant to flourish in the sunshine, feeding the bulb for the next bloom. Leave the plant outside until it is hit by a light frost or until the temperatures are in the 0-2c (32-36f) range. Then bring the plant in, place it in a cool spot and stop watering. The leaves will then die back, the bulb will rest and start developing the next bloom. When it is close to Christmas starts to lightly water the bulb until the bloom(s) start to emerge from the bulb. Once this happens move the bulb back into the strongest light you can provide and start the whole process over again. Taken Dec 17th when it received its first drink after its rest. two bloom heads per bulb. This process has work every time I have tried it. With very little work you will be rewarded with some beautiful blooms in the dead of winter and the best part is reblooming an Amaryllis is FREE! I am back home now, I wish I could have stayed longer but I guess a week is long enough. It was a great get away, lots of relaxing and nature viewing. This was the first time I had gone north in the winter and it was surprisingly enjoyable even with the cold. It was also my first visit to the Bruce Peninsula and it is one amazing area. The area was once part of a shallow warm sea some 450 million years ago. The results of this has left the peninsula with masses of sedimentary rock and ancient reef structures. In the warmer months the area can be mistaken for a tropical region with it's clear green/blue water and reef rock. The area contains 44 wild orchid species and is also a great place to see fossils. Marcia of Birds, Blooms, Books, etc, said she was interested in visiting the area so I thought I would share the company that books cottages in the area. We used Ontario Cottage Rentals which represents both the renter and the cottage owner. They list numerous cottages and have lots of photos that make it a much easier decision. Now for some photos. I have way too many photos for one post so I will post some photos I took at the cottage today. I will then post some photos I took in the area next week. I also have an amaryllis post coming up and I will be planting onions very soon. Finally some veggies to blog about soon! snowy seed pod. i'm not sure of what type of shrub this is, maybe Tina knows?